Here you will find a table of the Fuji fixed lens 6x7cm and 6x9cm Cameras produced over the years. I have put down "low" and "high" prices to give you a sense of what these cameras sell for in EXCELLENT, CLEAN CONDITION. If you are patient, you can find super bargains on ebay. The GW690 and GSW690 Cameras were produced in three versions ( models I, II and III ). The GW670 Camera had two versions ( models II and III ). The lens on the GW670II, GW670III, GW690, GW690II and GW690III is identical - the Fujinon 90mm F 3.5. All of the GSW models have the same 65mm F5.6 lens. I dont know if there were any improvments in coatings, but all are labeled EBC. Prices between versions are not great, as most of the changes over time were cosmetic and ergonomic improvements - not optical performance. The last versions always sell for more, but most users of the second version camera are very pleased with their purchases. These camera provide very high quality for good value. The GSW ( "super wide" ) camera has a secondary benefit, it can be used for quality, panoramic photography. Since this camera provides a semi-wide angle view on on a 56 x 82.6mm negative, I basically crop the negative in half along the height, for a 27.5mm by 82.6mm negative, which is a 3:1 ratio. Why is this significant ? The neg is 27.5mm in height which is actually 10% more negative than an XPAN camera ( which has a 22.5mm neg, height ). Blowing up this negative 8X provides a nice 8 inch by 24 inch print of very good quality.... my point ? With this camera you get a great little panoramic option, built-in, for free, in addition to having a great wide angle camera on a 6x9cm piece of film. Changes include: New Rangefinder / Viewfinder, film loading release buttons added, camera back latch changed, bubble level, and body cosmetics. The 90mm lens is the same on all 3 models of the GW670 and GW690 Cameras. 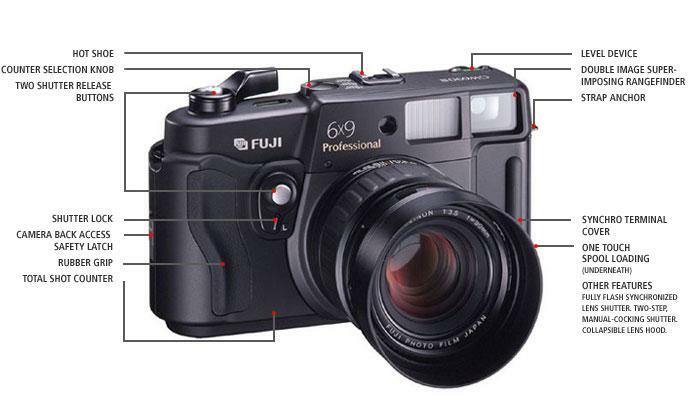 Changes include: Body grip checkered, hot shoe added, built-in lens shade, film switch changed. Manual below. 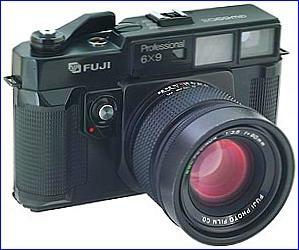 Fuji made 65mm F8 and 65mm F5.6 interchangable lenses for the G690 cameras in the early 1970's. The F8 lens had 6e/4g, while the F5.6 lens had 8e/4g.